Use dongle to connect iPad to projector. You also MIGHT be able to just open it by clicking on the file while in Google Drive – it just might play in the browser window. Kids export their Keynote to iCloud. On your laptop, open a new web browser window, and surf to icloud.com. They login with their AppleID and password [should be their Moodle password, some might have 1871 added to the end]. They can play their Keynote presentation inside the web browser window. Students export the keynote as a PDF. They email it to you OR stash in Google Drive. You open it up on the laptop, and just display the PDF file. You’ve created a Keynote presentation, and need to get it to your teacher in a way that can be viewed on their laptop [which does NOT have Keynote installed]. Here is how to make sure your presentation can be viewed [and thus graded!]. Click any picture below to see a bigger version. On your iPad, open up the presentation. Click the “Share” icon – square with arrow coming out of it. If you want to email the file, see #4 below. If you want to upload a PDF or Powerpoint file to Drive from your keynote presentation, see #5 below. Pick a file format – PDF or PowerPoint. Ask your Teacher if you don’t know which to use. Select “Mail”. Fill out the email, and send it. After the file has uploaded you can email it, share it with your teacher, view it online, etc. The principle here is dealing with file formats. In this case the students are creating files that the teacher needs to read, but that app is not available for the teacher’s computer [Keynote is a Mac only app, and most MDS teachers have Windows machines]. So how do you deal with the situation where you are creating in one app and need to open it in another? Find a file format that both sides of the equation can use. 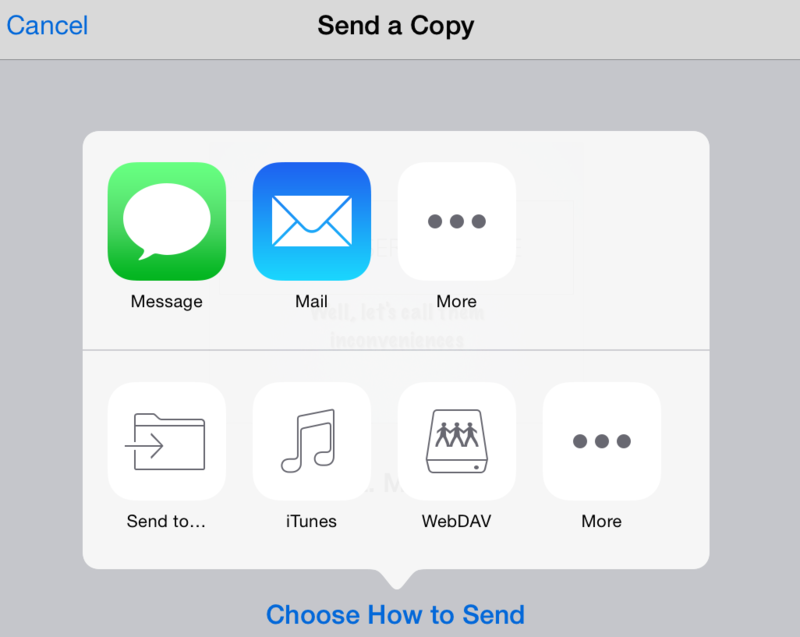 Export the file from your app, and the recipient can open it in the app of their choice. Video: trickier, because it involves not only the “container” [mp4, mov, avi, wmv, m4a] but also the “codec” [how the video was prepared]. Export the same file a few different ways and see which one works. In the list above, you are walked through the steps of taking a keynote presentation on an iPad, exporting it as either a PDF or PPTX [Powerpoint] file, then uploading it to Drive. The teacher can then open the file up in a PDF reader or Powerpoint.